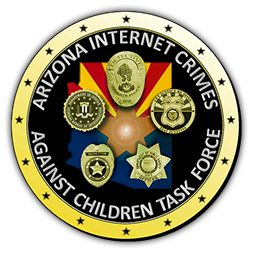 The Arizona Internet Crimes Against Children Task Force is comprised of investigators from City, County, State, and Federal Agencies. Special emphasis is placed on locating, prosecuting, and imprisoning people who intentionally exploit children. Lead by the Phoenix Police Department’s Internet Crimes Against Children Unit, the AZICAC Task Force diligently pushes to fulfill this goal with highly trained and professional investigators and cutting edge forensics and technology. The Arizona Fraternal Order of Police supports adequate state funding for AZ ICAC. We greatly appreciate the governor and legislature passing a 2014 special session $350,000 fund match the federal AZ ICAC grant.